When you stay at The San Anton Hotel in Bugibba, you'll be in a shopping district and convenient to Bugibba Beach and Birdpark Malta. This hotel is within close proximity of Malta National Aquarium and St Paul's Island. Make yourself at home in one of the 262 air-conditioned guestrooms. Complimentary wireless Internet access is available to keep you connected. Bathrooms have shower/tub combinations and hair dryers. 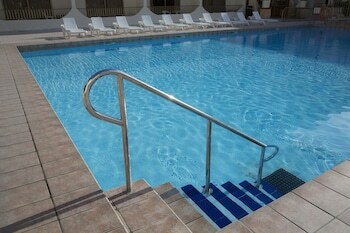 Take advantage of recreation opportunities including a spa tub and a seasonal outdoor pool. Additional features at this hotel include complimentary wireless Internet access, gift shops/newsstands, and tour/ticket assistance. You can enjoy a meal at a restaurant serving the guests of The San Anton Hotel, or stop in at a snack bar/deli. Relax with your favorite drink at a bar/lounge or a poolside bar. The San Anton Hotel is the perfect St Pauls Bay lodging choice for your trip to Malta. With numerous amenities for guests such as gift shop, jacuzzi or spa, laundry, you will wake up at The San Anton Hotel feeling invigorated every day for your time in St Pauls Bay. Don’t let this amazing reservation opportunity pass you by, book your stay at The San Anton Hotel today to make the most of your time in St Pauls Bay, Malta.